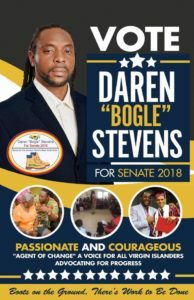 Basseterre, St.Kitts (August 2nd, 2018):- Well known USVI based St.Kitts born and raised personality Daren “Bogle” Stevens has officially launched his Senatorial Campaign for the upcoming 2018 General Elections in the US Virgin Islands. Stevens is listed among the 110 individual candidates who are presently listed on the official list issued by the USVI Supervisor of Elections for the Sat., Aug. 4 primary and Tues., Nov. 6 general election. Stevens will be vying for a Senatorial seat on St.Croix and will be running as an Independent Candidate with no party affiliation. Five individuals are running for the position of at-large senator, with three facing off in the Saturday, Aug. 4 Democratic Party primary. Twenty-five people are running for St. Thomas’ seven seats in the Legislature, with 14 Democrats vying in the primary for seven spots on the ballot. St. Croix has 29 candidates for the Legislature, with 17 Democrats vying for seven spots on the ballot. Six are running for the Board of Education and nine for the Board of Elections. And 27 people are seeking party offices. In 2014 the St. Croix Chapter Of St. Kitts-Nevis Association Honored Stevens for his contributions in the fields of media and entertainment, as well as for community and youth activism throughout the Caribbean. 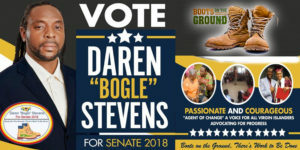 Daren Stevens’ was born in McKnight and had his education at the Basseterre Junior and Senior High School where he graduated before moving on to the Virgin Islands.